I really enjoy reading books with multiple points of view. Recent reads have been the ACROSS THE UNIVERSE books, BLOOD MAGIC and CROSSED. In looking at books with multiple points of view, it’s important to get into the character’s head. 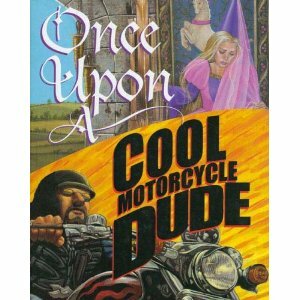 A book I thoroughly enjoyed, as did my students, was ONCE UPON A MOTORCYCLE DUDE by Kevin O’Malley. The fairytale was written by his two characters, one a girl and one a boy. What made this book so special was the illustrations because they match well with the text. The illustrations done by Carol Heyer match the text perfectly with soft pastel colors, flowers and ponies. And the illustrations are full of dark colors: blacks, reds and silvers. In fact, Heyer doesn’t illustrate these but it’s an entirely different illustrator, Scott Goto. There are words like volcanoes, thunder, lightning, battles, and giants. I loved how distinctly different the characters were and their point of views. It made the story hilarious (sure it was a little stereotypical) but I couldn’t help but think, this is the perfect example of a book that shows point of view switches! Ultimately, it’s important each character has their own distinct voice. If you were to open the book and randomly pick out a page, would you be able to identify who’s telling the story at that point by the voice? How about you? Have you written or read a great book with multiple points of views? This sounds like a good read, Christy. I’ve tried writing with multiple POV, but ending up rewriting to change it back to a single one. It was too hard for me to tell the story I wanted to tell. But, I’d definitely try it again if it suited the story. Maggie Stiefvater does multiple POV well in her Shiver series! Thanks for nice review Christy. Kevin! Oh I’m flattered you stopped by. My boys and student love your work. Cheers. I love multiple POVs. I can’t remember title or author, but once I read a book with 11 POVs — an entire class plus the teacher. I’m using 3 POVs in my new WIP.